The Hills are Syrupy Sweet...and Some Say Haunted Too! A couple weeks ago I made my very first hootenanny. Now my Appalachian roots run really deep, but until recently, I had never even heard of a hootenanny! Have you ever heard of one...made one...tried one? Not long ago, it came to my attention that a hootenanny is a pancake-like dish that supposedly has Scottish roots but was then brought over to Appalachia. I have no idea whether this is the case or not...but if the hootenanny isn't really Appalachian, I believe I'll adopt it anyhow! It was as good as breakfast food gets! And it's incredibly easy, because you throw the whole thing in the oven. So you don't have to fiddle with the flipping at the griddle...now I sound like a hootenanny commercial slogan! Oh, and this thing is fun to watch bake as well. It puffs up in all kinds of crazy shapes as it heats, so grab the kids to watch it rise. It's not pretty, but it was delicious....my first hootenanny! The recipe I used is by Rachel Schultz and you can find it here. Oh, and if any of you all actually grew up eating hootenannies in Appalachia, please let me know...'cause I'm wondering how in the world I missed out all these years! So I tried my hootenanny two ways: sugar sprinkled on one half, honey on the other. And then the rest of my family coated their hootenannies in "store bought" pancake syrup. All this variety got me to thinking about traditional Appalachian sweeteners and how they've influenced my taste buds. 'Cause see, I don't do the whole run of the mill bottled pancake syrup "thingy." We grew up mostly eating honey on our pancakes. Honey...my sweetener of choice for pancakes. It was a sweetener my parents grew up eating and liking in the thirties and forties in Eastern Kentucky, so it is one we always had on hand in Ohio too. If you knew where to look and knew what you were doing, honey was a treat that the hills would provide...with help from the bees of course! When I was little, I even liked to eat the honeycomb with the honey...and I remember the first time I tried the comb was sitting at the table on my mamaw and papaw's farm in Appalachia! And I assume you all are familiar with sorghum, right?! That is something my mother has frequently liked to use in the kitchen as well. My mother has almost always sweetened her dried apple stack cakes with sorghum...a treat I love! And I think I was nearly a teenager before I knew there was any other flavor of popcorn ball out there other than sorghum molasses! 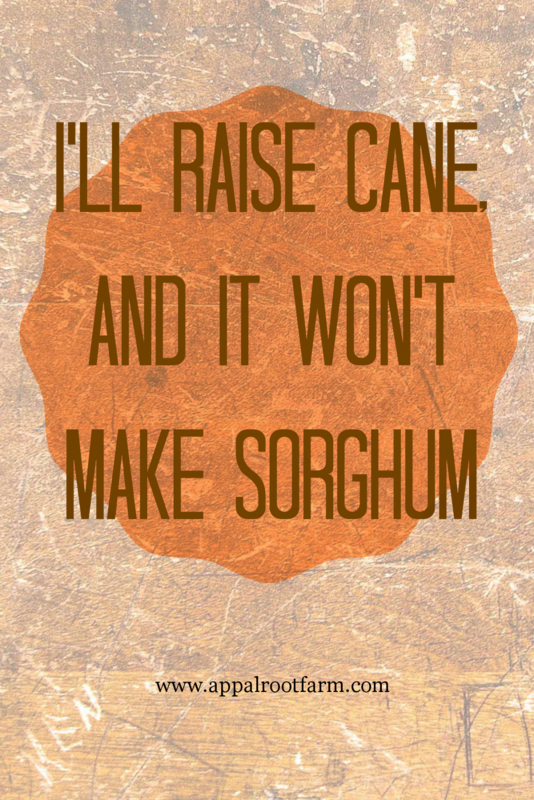 This actually reminds me of one of my mother's favorite sayings when she got aggravated at us..."I'll raise cane, and it won't make sorghum!" I'd say we'd be hard pressed to find too many people with Appalachian roots that hadn't heard a similar saying pass between their mothers' lips at some point! Oh...and one more sweetener ('Course this one is store bought...and not quite as "traditional." But since about the only place I've eaten it is on my grandparents' farm in the hills of Eastern Kentucky, it's got to be included! ), how about Bob White Syrup on homemade biscuits?! Yum! By the way, did you all know you can order Bob White Syrup online? If you're interested, check it out here. Syrup and butter over biscuits sure is a great old timey treat...when I was young, my mother even taught us to mix honey and butter together on our plate to sop our biscuits through. My siblings and I loved it so much that we would even eat it sopped up with plain old store bought white bread. And don't tell anybody, but I've even eaten it "sopped up" with Saltene Crackers when nothing else was on hand! What a simple but memory-filled treat from the mountains! So it's not really a recipe per se (because it's so super easy and you can adjust the amount of any of the ingredients to suit your taste)...but here is my version of "Appalachian Style Buttery Syrup for Sopping!" The ingredients aren't many. You can use either honey or sorghum syrup. I show both in the ingredients picture...but just pick one! Butter, honey or sorghum, and salt are all you need for this simple treat...oh, and something for sopping! Cut butter into pieces on your plate. Add honey (what I chose) or sorghum, and then smash and stir with a fork until you remove most of the large lumps of butter. Now, I never did this growing up, but adding a little salt sure does bring out the flavor of this mixture! I used Kosher salt. It gave some sharp pops of saltiness at the end of each bite. But you can use regular salt, or leave it out altogether. But I like a little salty to cut the sweet! When I made mine in the pictures, I didn't happen to have any homemade biscuits on hand at the time to do my "sopping"...so I put mine on a Pumpkin Spice English Muffin. Mmmm...glad I did...made a great fall treat! Cut butter into pieces on a plate. Pour honey or syrup over the butter. Mash and stir with a fork until most of the butter lumps are removed. Stir in salt if desired. Serve with biscuits or other bread for sopping. Speaking of syrup, when I was little, my mother always made sorghum popcorn balls around Halloween. 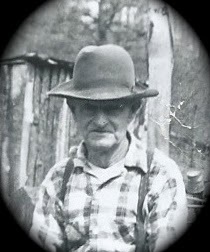 So I would be remiss to end this post without a little Appalachian "haint" tale! Now, just to clarify, I don't believe in ghosts...I'm a believer of the Bible, and I don't feel that God's word backs up the concept of ghosts in the way we think of spooks and hauntings and such. But I can laugh and say..."I don't believe in ghosts, but I'm afraid of them!" After all, who of us hasn't been given a few goosebumps by a good old Appalachian ghost story at some point?! So just for fun...here is a little "haint" tale that was passed down by my grandad. Now you've heard me speak of my mamaw and papaw from Eastern Kentucky...but my other grandparents I have not really mentioned yet. They were from the same area of Eastern Kentucky as my mamaw and papaw. These other grandparents, who I will refer to as Grandad and Granny, passed away before I was born. And this is that grandad's tale. One evening, Grandad and a friend of his were heading home on their horses after working in somebody's field in the head of a creek all day. It was still light enough to see...but the evening was coming on. They were riding their horses through the bottom towards the mouth of the creek. Now at the mouth of the creek sat an old church that had been there for years. And up on the hill overlooking the churchyard, was an old cemetery used by members of the church and other people in the rural community. This is the creek bottom that Grandad and his friend were riding their horses out of. In the distance, you can see the location where the old church sat. Well, right before Grandad and his friend got up next to this old church, their horses stopped and acted spooked. Grandad said that all of a sudden what appeared to be a horse-like creature rose up out of that old churchyard, floated high in the air, and soared right up onto the hill and landed somewhere in that old graveyard! can see some of the old gravestones. Grandad looked over at his friend and said, "Did you see that?" His friend replied that, yes, he had seen the very same thing. It looked like some sort of flying horse, but without wings. They never did figure out what they had seen, and grandad continued to tell the tale of the "ghost horse" for years to come. Hope you've enjoyed Grandad's "haint" tale...and all the talk about sweet syrup! Feel free to drop me a line and tell me about your own favorite Appalachian ghost story...and don't forget to keep passing those old tales on to the next generation too! They can make for a really fun and nostalgic Appalachian-style Halloween! Blessings to you and yours! Happy fall, everybody! I'm loving watching the leaves just begin to change, how about you? A couple of weeks ago I got to do what is becoming one of my favorite beginning of fall activities: shop at a huge annual antique, home decor, and craft fair. As I've said before, I love looking for items for my home that remind me of my roots. But let me tell you, at this year's fair, I came face to face with a really big reminder about those roots, and it was quite a surprise! Do you all know what shuck beans are? Maybe you've heard them called shucky beans or leather britches. My family has always just called them shuck beans. If you've never heard of them, they are green beans which are dried with the shell (hull) still on them. They can be dried the traditional way by stringing them together to hang, or even dried on a window screen in the sun (the way I've watched my own mother from Eastern Kentucky dry them). You then soak them, and cook them low and slow. They're really good and have a much different flavor than regular green beans. You really can't get much more Appalachian than shuck beans. They are a tradition that goes back generations in southern mountain kitchens. So anyhow, I'm walking along shopping at this fair, and in one of the booths something caught my eye. There, hanging on the rungs of an old-timey ladder back chair, were strings of dried shuck beans for sale! Now, mind you, this fair is held in the middle of a northern city, so seeing these strands of shuck beans for sale really did surprise me! And you'll never believe what each strand was being sold for...$12! I don't know about you, but I believe seeing shuck beans for $12 would have left my Appalachian grannies speechless! I was a little tongue-tied myself! That would sure make one pricey pot of beans! Now by all appearances, these beans were being sold for primitive style home decor purpose instead of for a stove pot...but whatever they were being sold for, I was thrilled! 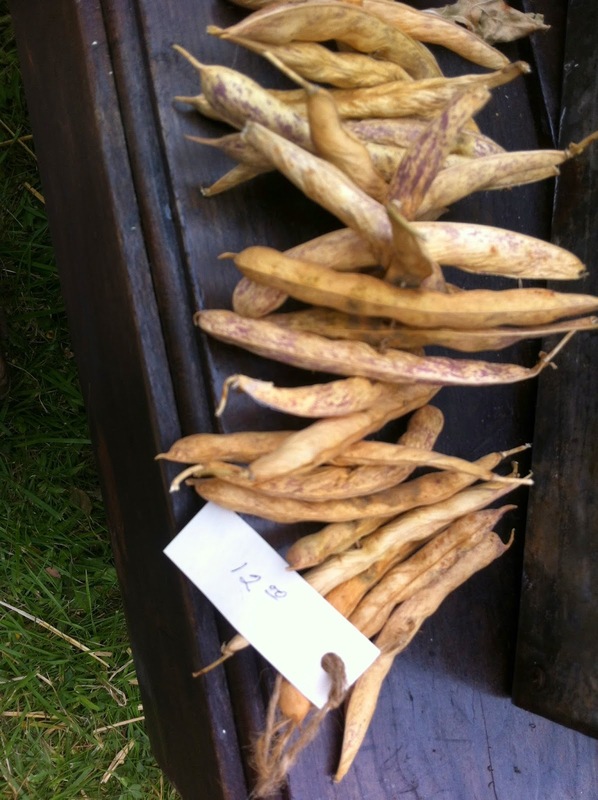 Now I don't know how many people at that fair would have known what those beans really were or not, but the very fact that such a traditional and deeply rooted Appalachian food (or decor item, if that floats your boat) was being sold for $12, is certainly worth celebrating! I love the fact that others are finding it worthy of selling, worthy of decorating with, and certainly worthy of eating! To me it's a sign that the rest of the world is maybe beginning to see that Appalachia does have worthy things to offer. I walked away from that fair booth feeling so proud of my Appalachian heritage! Now wasn't that a great down home surprise?! By the way, in addition to Facebook and Pinterest, you can now follow Appalroot Farm on Twitter @AppalrootFarm. I'm still trying to get the hang of Twitter...so would love for you to head on over there and give me some encouragement! See you soon...in the meantime, hope you are getting out and enjoying the wonderful fall weather!